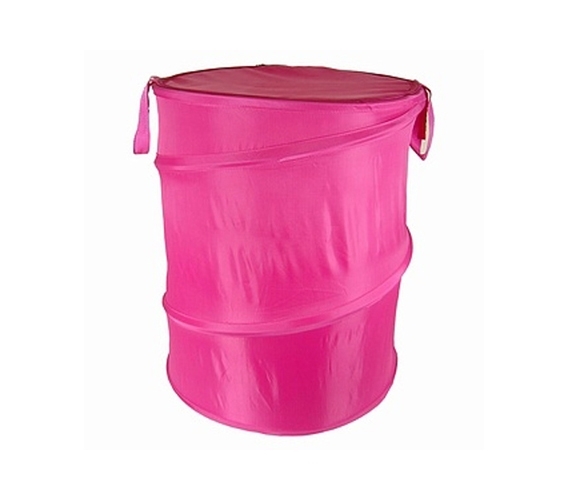 A laundry hamper for college that's pink is already worlds better than your everyday, basic hamper. No matter the event, even if it's in this case something as mundane as laundry in college, pink can bring some vibrancy and excitement to the situation. Pink also stands out from all the other colors. This can be pretty important, as believe it or not it's quite easy to grab someone else's dorm laundry hamper thinking it was yours! That's always an awkward situation. With this Hot Pink Bongo - Durable Dorm Laundry Hamper, that embarrassing situation shouldn't occur! Similarly, you won't have to worry about other students grabbing your laundry bag for college by accident. Aside from its color, this vital college laundry supply has more than just one or two useful features. As you can see, it has a lid, which is rare for laundry hampers for college students. A lid lets you seal in your laundry and doesn't make a show out of your dirty clothes when you're carrying them to the laundry room. Just be sure to actually do your laundry before the hamper is overflowing or that lid will be useless! Since this college hamper is made from nylon, it'll be durable enough that you won't need a new, cheap hamper every year. And when move-out day finally rolls around, you'll appreciate that you can squash this hamper down for easy transportation.